Eventide booster pack contains 15 cards each. The distribution is 1 rare, 3 uncommon, and 11 commons. 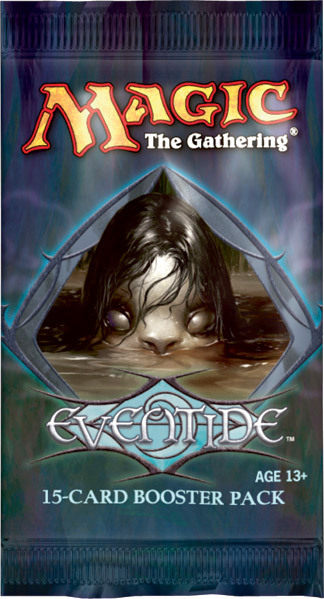 Released on July 25th, 2008, Eventide is the second, and final set in the Shadowmoor block. The set contains 180 black-bordered cards (60 rare, 60 uncommon, and 60 commons). Eventide is an expansion set, codenamed "Doughnut", from the trading card game Magic the Gathering. The pre-release events for this set were held on July 12–13, 2008. Eventide is the second set in the Shadowmoor block, which is part of the Lorwyn/Shadowmoor superblock. The two blocks mirror each other in many different ways including flavor and mechanics. Even the expansion symbol of Eventide has striking similarities to that of Morningtide, its counterpart in Lorwyn where the Morningtide symbol suggests a full sun, the Eventide symbol suggests a mostly eclipsed sun. Retrace: this ability allows one to play a card out of one's graveyard with an added cost of discarding a land. Chroma: this ability word makes the number of mana symbols of a particular color a variable which determines the effect of a card. One card from Eventide, Phosphorescent Feast, had already appeared in Future Sight, but without using the ability word Chroma. The Eventide booster packs also include a rules card/token card in addition to the normal 15 game cards. Five theme decks were released as part of the set. The preconstructed theme decks are: "Life Drain" (White/Black), "Sidestep" (Blue/Red), "Death March" (Black/Green), "Battle Blitz" (Red/White), and "Superabundance" (Green/Blue). The hybrid lands — The cycle of lands from Shadowmoor was joined by their enemy colored counterparts in Fetid Heath, Rugged Prarie, Cascade Bluffs, Flooded grove, and Twilight Mire. This made the Hybrid Land cycle the fourth rare dual land cycle to be made for both allied and enemy colors. The others were the original "Dual Lands" from Beta, the "Pain Lands" from Ice Age and Apocalypse, and the "Shocklands" from Ravnica block. With the more recent printing of Zendikar and Innistrad, there are now six rare dual land cycles made for both allied and enemy colors. Figure Of Destiny — This card was handed out at the Launch Parties, tournaments organized to celebrate the release of Eventide. It was also a tournament staple in Standard for as long as the card was legal in the format and has made some token appearances in Extended. The card's power lies mostly in its flexibility, being a cheap, small creature that can become much more powerful in the later stages of the game. The card was credited as inspiration for the 'Level Up' mechanic seen in the Rise of the Eldrazi expansion. Overbeing of Myth — This was the card handed out at the prerelease events. In the prerelease version the card is foiled and has a special artwork.